The Anglo-American billionaire dynasty are prolific philanthropists and some of Britain's best-known art galleries, museums, theatres and universities have benefited from their generosity. But behind the money is a firm called Purdue Pharma, a US company owned by many of the Sacklers which makes opioids - a class of drugs linked to the deaths of thousands of Americans. Now some in the arts say they don't want the Sacklers' money anymore. 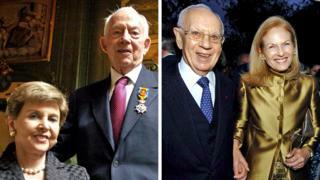 The family's fortune, estimated at $13bn by Forbes magazine, was started by three brothers from Brooklyn, New York. Much of the Sackler family's fortune comes from Purdue Pharma. Thanks to the billions generated by Purdue and donated by the Sacklers, the family name can be found adorning a wing of the Louvre in Paris, in the Metropolitan Museum of Art in New York as well as the V&A, the Serpentine and Shakespeare's Globe in London among many, many others. But Andrew Kolodny, co-director of the Opioid Policy Research Collaborative at Brandeis University, describes the philanthropy as "reputation laundering". "That's what they were doing with all of this money they were giving to museums and to universities," he says. "Their wealth was earned through the sales of a drug similar to heroin.'" A spokesperson for Sackler family members said, "For more than half a century, several generations of Sacklers have supported respected institutions that play crucial roles in health, research, education, the arts and the humanities. It has been a privilege to support the vital work of these organizations and we remain dedicated to doing so. "While plaintiffs' court filings have created an erroneous picture and resulted in unwarranted criticism, we remain committed to playing a substantive role in addressing this complex public health crisis. "Our hearts go out to those affected by drug abuse or addiction." Others involved or have been with Purdue are Raymond Sackler's wife Beverly, their other son Jonathan and Raymond Sackler's grandson David. His wife Dame Theresa Sackler - a trustee of the V&A - has been a board member at Purdue as have Mortimer's daughters Ilene Sackler Lefcourt and Kathe Sackler and son Mortimer Sackler. He says: "There wasn't very much money to be made if OxyContin had only been prescribed to people at the end of life with cancer because end of life cancer pain is not that common and people won't be on your drug for very long at the end of life." "So the way you can do well with a pharmaceutical product is if doctors prescribe it for common problems like lower back pain or headaches. If you have a drug that is difficult to stop taking you've got a pretty good recipe for financial success." Dr Kolodny says that for people in their 20s, who may have tried a prescription opioid "for fun" and become hooked, it was difficult for them to get more off a doctor because they looked healthy. "The pills on the street, even in 2001 were very expensive, he says. "So young white people in the US in their 20s and 30s started switching from pills to heroin." Purdue says that OxyContin "constitutes an exceedingly small per cent of the prescription opioids prescribed in the US" which it says is less than 2%. Dr Kolodny says: "Certainly there were other drug companies that saw how well this was working out for Purdue and got into it early on as well." But he claims: "Purdue got the ball rolling." What's behind the Tate and National Portrait Gallery's decision? In particular, the complaint by Massachusetts Attorney General, Maura Healey, recently released a number of potentially damning documents and alleges that "they directed deceptive sales and marketing practices deep within Purdue". It paints the Sacklers as forceful board members, intent on pushing Purdue Pharma's salesforce to persuade doctors to prescribe more and more OxyContin at higher doses to their patients. In an email included the Massachusetts complaint, Richard Sackler wrote: "We have to hammer on the abusers in every way possible. They are the culprits and the problem. They are reckless criminals." Purdue Pharma forcefully denies the claims made in the lawsuit and has filed a motion to have the lawsuit dismissed. It says it is "is replete with sensational and inflammatory allegations" and is "oversimplified scapegoating based on a distorted account of the facts unsupported by applicable law". For the some of the people who have been campaigning against the Sacklers, announcements by the Tate and the National Portrait Gallery are "very welcome". LA Kauffman, an activist and author who is a member of Prescription Addiction Intervention Now, a group started by US photographer. Nan Goldin who became dependent on OxyContin, says it is a sign "the tide is really turning". But she says while it is important to "acknowledge that this was a bold step for institutions to take", she asks; "If museums don't stand for the basic value of human life what do they stand for?"